O, increasing over this time period primarily because descent of air in the polar vortex brings air with higher O, abundances downward. Also plotted (circles) are the observed O, changes over the same period. The difference between the passive-tracer calculation and the observed O, is an estimate of chemical loss of O, (diamonds). In 1994 (Figure 7.24a), descent of O.-rich air cancels most of the total chemical O, loss. The net result is that vortex-averaged lower-stratospheric ozone remains fairly constant despite estimated chemical loss of -0.4 ppmv of O, In contrast, in 1996 (Figure 7.24b) there was less transport of 0,-rich air from above as well as significantly greater chemical loss. The net result is a large decrease in lower-stratospheric Or Chemical loss and transport of O, in the Arctic generally fall between these two extreme cases. It turns out that the two processes that can control Ox in the northern hemisphere lower stratosphere—chemistry and transport—are not independent. As air descends, it is warmed through compressional heating. Thus, years with significant vertical descent in the polar vortex—and hence significant vertical transport of Ot—are associated with a warmer polar lower stratosphere. Warmer temperatures mean less PSC processing and therefore less Or loss than in a colder vortex. The strong vertical descent is also associated with enhanced horizontal transport of air into the lower stratosphere from mid-latitudes. 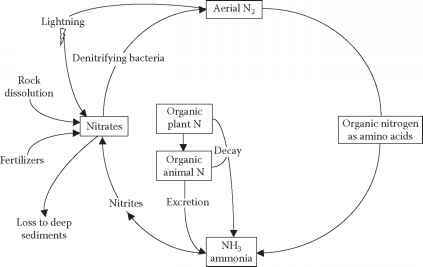 The strong descent case is exemplified in 1994 (Figure 7.24a), a year in which there was little chemical loss of Ox and significant transport of 0, from above. The net result was only small changes in observed 05. Weak descent, on the other hand, is associated with little compressional warming and therefore colder temperatures in the polar lower stratosphere. These cold temperatures support enhanced PSC processing and more O, loss. The weak descent also implies a small amount of transport of Ot-rich air into the lower stratosphere from above. The weak-descent case is exemplified in 1996 (Figure 7.24b), a year in which there was significant chemical loss of O, and little transport of O, from above. The Antarctic polar vortex can be considered the extreme limit of the weak descent case: during the maximum ozone loss period in the Antarctic, vertical descent has essentially stopped and temperatures are nearly at radiative equilibrium. PSC activity is consequently widespread and the Ov-loss rate is high. As suggested by this last discussion, the meteorological conditions of the Arctic exhibit significant year-to-year variability 1272-274], This variability is significantly greater in most vortex metrics—size, temperature, wind speed at vortex edge, etc.— than is seen in the southern hemisphere. Additionally, the temperatures in the northern hemisphere polar lower stratosphere tend to be near the 196 K chlorine activation temperature threshold. Thus, normal variations in temperature of just a few degrees can significantly change the amount of the vortex that is exposed to temperatures below the chlorine activation threshold. This leads to significant interannual variability in the amount of Ox lost (as shown, for example, in Figure 7.24 and by Manney el at. 1276]). ClOOCI and photolysis of ClOOCI. Calculate the solution in terms of k*atMIO, Jcmhki- and |C1J. (c) determine [Cl| as a function of IC1J. 2. Even under favorable conditions the rate of loss of ClONO, in heterogeneous reactions is not much faster than the rate at which ClONO, is destroyed in photolysis. Why, then, does heterogeneous loss activate chlorine, while photolysis does not? (a) if the photolysis rate of HNO, is 1/(30 days) and there are no sources of HNO„ write an expression for the abundance of HNO, as a function of time. Assume the initial abundance of HNO, is 10 ppbv. (b) If all of the NO, produced in HNO, photolysis combines with CIO to form ClONO,, use the answer to part (a) to write an expression for d\C\.}ldt. (c) Integrate this equation to determine CI, as a function of time. Assume the CI, abundance at t = 0 is 3 ppbv. (d) Assume that this air mass encounters PSCs every 5 days. When the air mass hits a PSC, CI, and HNO, abundances return to their initial values of 3 and 10 ppbv, respectively. What is the average value of CI,? (e) Now assume the air is denitrified, so the initial abundance of HNO, is 1 ppbv. In this case, what is the average value of CI, abundance? (f) Explain how this helps explain the differing amounts of O, lost in the northern and southern hemispheres. 4. The O, continuity equation. (a) Write the full continuity equation for O,. (b) Which terms are important during August and September in the Antarctic polar vortex? (c) Which terms are important during February and March in the Arctic polar vortex? (d) Is it possible for (), loss to be occurring in the southern hemisphere polar vortex but for the Or abundance to not be decreasing? And in the northern hemisphere? Explain why.